Explanation: In the early morning hours of June 30th, ghostly clouds hovered in the east in this view of near dawn skies over western France. 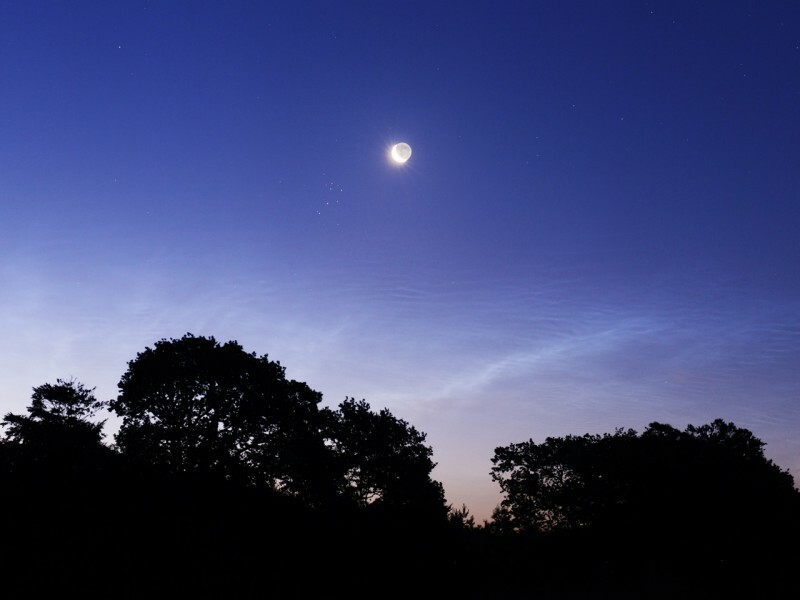 The noctilucent or night-shining clouds lie near the edge of space, reflecting sunlight from about 80 kilometers above Earth's surface. Usually spotted above the poles in summer, they are now seen with increasing frequency farther from the poles, in this case extending to the photographer's latitude of about 48 degrees north. The trend could be a telltale sign of global changes in the atmosphere. Another 400,000 kilometers away, the Moon's sunlit crescent shines brightly, its night side illuminated by Earthshine. Of course, as a bonus for early risers June's old crescent Moon was followed closely across the sky by the lovely Pleiades star cluster, surrounded by cosmic dust clouds and shining from a mere 400 light-years away.